It began with him agreeing to play an original tune. It’s called “Circus Waltz.” Here’s the original recording. While I remembered the conversation as somewhat terse, the audio reveals that we had a very pleasant chat. Jones was not only very forthcoming about his music, but actually quite friendly. I have no idea how I’d someone come to remember things so inaccurately. So, let’s set the record straight. What does he like about the harp? It turns out to be the same reason that most people like listening to it. 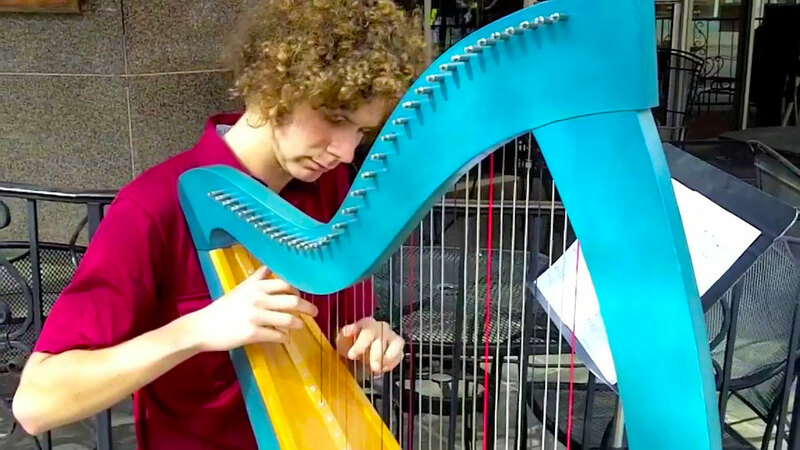 Jones plays a Lyon & Healy lever harp, which he described as being “like the Fender or the Steinway of harps.” His particular model is a folk, or Celtic harp. At this point, I asked if he would mind me recording another tune. He agreed enthusiastically, and asked if I had any requests. I told him I was completely ignorant when it came to harp music, and said he should play a song he enjoyed playing. He thought for a moment, then said he knew exactly what to play. Since the source video was lost, I’ve combined this short piece with a segment of a film from the public-domain Prelinger Archives. Details can be found here. At the time, Jones didn’t have a website. It’s nearly three years later, and he still doesn’t seem to have one. The best I can do for those of you who like his music is to provide his email address. It’s a doozy, too: andrew.andrew.andrewjones.jones@gmail.com.